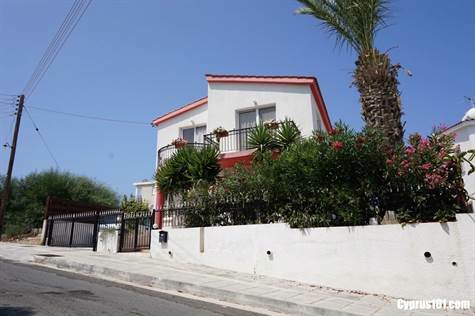 Chlorakas, Paphos – This particularly spacious 4 bedroom detached villa is located in the popular village of Chloraka within easy walking distance to village amenities. Paphos and the coast are a 5 to 10 minute drive away. All the rooms are spacious with good quality finishes throughout. The ground floor accommodation features a large open plan L-shaped living area with a light and airy living lounge, separate dining area, fully fitted kitchen and guest toilet. There is direct access from the car port to the kitchen which is well equipped with granite worktops, built-in oven, electric hob, cooker hood, American style fridge/freezer and dishwasher. Patio sliding doors in the dining room provide easy access to a covered veranda ideal for outdoor dining and the swimming pool to the rear. A marble staircase in the living room leads up to a spacious landing, four double bedrooms with fitted wardrobes and a separate family bathroom. The master bedroom has en-suite facilities and three bedrooms, including the master, have private balcony access. To the side of the property is a long driveway with car port which can easily accommodate 2 cars and to the rear is a stand alone storage room. The property for sale in Chlorakas is suitable as both a permanent or holiday home and has full title deeds.